The Delhi Youth Summit on Climate Change (DYSoC) is a pioneering initiative of Delhi Greens towards engaging, inspiring and training the youth for taking up Environmental Leadership at local, national and global levels. The Fourth Delhi Youth Summit on Climate Change (DYSoC 2018) will take place on 3rd and 4th October 2018 at and in collaboration with the MH Vatavaran Eco Club of Miranda House, University of Delhi. The two-day event will include interactive lectures, panel discussions, focused working groups and some hands-on learning. It will also discuss both the problems and solutions to the ongoing environmental crisis. In the climate constrained world of today, ‘development’ itself has become a threat to the environment. However, development – in the real sense of the word – is essential for growth and prosperity of a region and of a nation as a whole. Development should be sustainable and should not discount the needs and requirements of the future generation. In order to ensure ‘sustainable development’, it is the youth who will have to take the lead because it is the future of the youth which is at stake. DYSoC 2018 is now open for registrations and invites the youth of Delhi NCR and of India to participate in this two day event and get their voices heard. 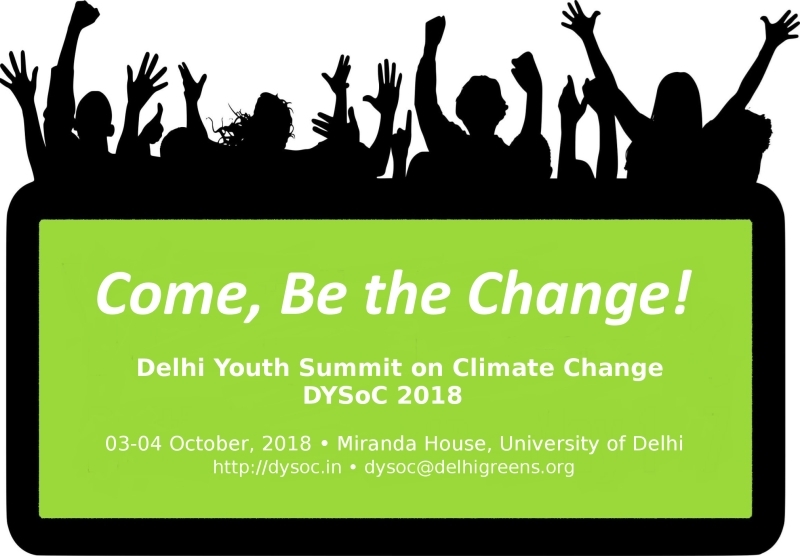 If you are a young person, are concerned about the rising global carbon dioxide concentration, feel for Delhi and India, want to work or are already working for protecting and preserving our common environment, Delhi Greens invites you to register and participate in DYSoC 2018, equip yourself and help develop a youth charter for ensuring urban sustainability of India’s National Capital Territory of Delhi. There is no Registration Fee for this event. Registrations are open till 21st September 2018. Details of DYSoC 2018 (including FAQs) can be read on the dysoc.in website by clicking here.